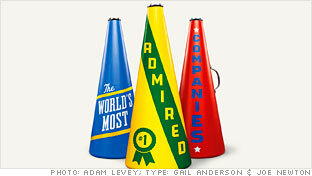 To appear as Most Admired, a company must have scored in the top half of its industry survey. The rest are listed as contenders. Times have been tough for global auto makers � but these automakers managed to stand out. Which technology firms have the best reputations? These firms are the envy of their peers everywhere. Wal-Mart or Costco? Coca-Cola or PepsiCo? Take our quiz and see if you perform admirably. 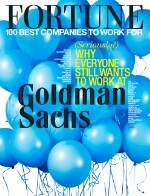 Fortune's Adam Lashinsky explains how Apple keeps projects secret, even from its own employees. Caterpillar makes multimillion-dollar machines for export around the world. They say it's creating U.S. jobs. The 'Save money. Live better' slogan represents an evolving transition of what the retailer stands for. The legendary investor sets the record straight on his plan to tax millionaires at a higher rate. Where are the Most Admired? The Most Admired companies in America are spread out across the country, but a few states dominate. These 20 Most Admired companies have landed among the top in their industries for multiple years. The experts chose the top 50. Now it's your turn. 'Like' the company you most admire to vote. The top 5 reader favorites are below.